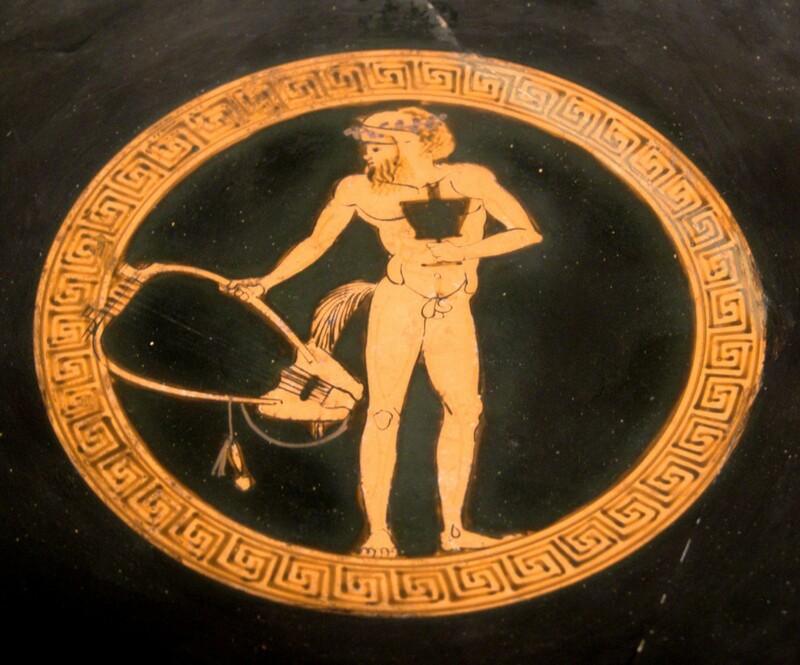 Satyr with a kantharos and a lyre. Tondo of an Attic red-figure kylix, 460-450 BC. From Vulci. Cabinet des Médailles, Paris, France. Photo: Wikimedia Commons. “Suppose that 2,500 years from now all that survived of the Beatles songs were a few of the lyrics, and all that remained of Mozart and Verdi’s operas were the words and not the music. Imagine if we could then reconstruct the music, rediscover the instruments that played them, and hear the words once again in their proper setting, how exciting that would be”. Dr David Creese of the University of Newcastle has constructed an eight-string “canon” (a zither-like instrument) with movable bridges. When he plays two versions of the Seikilos tune using Ptolemy’s tunings, the second immediately strikes us as exotic, more like Middle Eastern than Western music. The earliest musical document that survives preserves a few bars of sung music from a play, Orestes by the fifth-century BC tragedian Euripides. It may even be music Euripides himself wrote. Music of this period used subtle intervals such as quarter-tones. We also find that the melody doesn’t conform to the word pitches at all. Euripides was a notoriously avant-garde composer, and this indicates one of the ways in which his music was heard to be wildly modern: it violated the long-held norms of Greek folk singing by neglecting word-pitch. However, we can recognise that Euripides adopted another principle. The words “I lament” and “I beseech” are set to a falling, mournful-sounding cadence; and when the singer says “my heart leaps wildly”, the melody leaps as well. This was ancient Greek soundtrack music.